Pokémon HeartGold & SoulSilver are remakes from previous games for GameBoy Color, Pokémon Gold & Silver, but obviously something had changed. With the techonology of the Nintendo DS we can see, better graphics, sounds, and new features added. The main characters of the game are "Gold", and "Kotone". Both characters will be able to carry their main Pokémon outside the Pokéball, like we saw in Pokémon Yellow of Gameboy Color with Pikachu, but this time there isn't restriction of size, type, etc. Also you will be able to interact with your Pokémon, see it's mood, and discover secrets with their help. 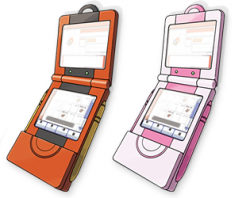 Also we have a new design of PokéDex, and comes in two diferent colors. Red for boys, and pink for girls. Also it has included the PokéGear like in previous games like Diamond & Pearl, and comes with more applications that are very useful. The game includes a new device called the PokéWalker. The PokéWalker works as a pedometer that count the steps. Also you can transfer your Pokémon to the PokeWalkér with the infrared that the device includes, to battle, raise their hapiness, and more. Another innovation is the Pokéthlon, a dome where you can play olympic games with your Pokémon, and have the chance to become an olympic champion. There are several mini-games that are truely awesome, and you'll spend hours having fun with it. In this game you'll be able to catch the three legendary dogs, Entei, Raikou, and Suicune, but you'll have the chance also to capture Articuno, Zapdos, Moltres, Mewtwo, Kyogre, Groudon, Rayquaza, Dialga, Palkia, Giratina, Latias, and Latios. 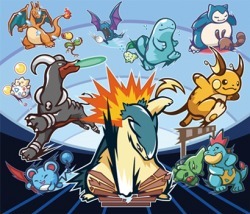 The difference of the two versions is that for example Kyogre only appears in Heart Gold, and Groudon in Soul Silver, and other similar Pokémon. In this game you can choose between Cyndaquil, Chikorita, and Totodile, but you can also get Charmander, Bulbasaur, Squirtle that you will find when you get the 16 badges, and also Treecko, Torchic, and Piplup. You can only choose one of each generation, but at least they appear as Pokémon able to get, what is something really nice from this version. Certainly this is one of the best remakes of Pokémon ever made, and if you enjoyed those old times with your Pokémon Gold & silver, you won't feel dissapointed of playing the awesome remakes of the latest generation of portable consoles.